check for already running process of startOnExit in startTSC(). Although I think check for running a process multiple times should be done in the target process. As there were some screen metrics hardcoded and more and more devices come with a VGA screen the hardcoded QVGA values will not match. So I extended the first version and implemented some additional logic and settings. First, the emulated screen tap has been adjusted to depend on the device screen width and height. For that I included the HIRES_AWARE resource to get the real screen size. The rdp file defaults for desktop width and height will also be calculated but you can set the default to use via the registry. As you can see, I added a line where you can specify an application that will be started at the end of the autoconnect process: startOnExit. What specifically is needed to accomplish this start to finish? Is there a way to delay Autologin so Wifi has time to connect first? We liked that this prevented RDP time out, but handheld wouldn’t sleep. Then I tried using RDM_KeepBusy, but had the same results. Is there a way to get handheld to sleep with RDM_KeepBusy or MyRDM Version 2 Raffaele Limosani running? Under Options Value for Full screen worked, but I couldn’t get FitToScreen=1 to work. And I don’t think Version 3 has option for Color Value. We liked that handheld went to sleep, because it saved battery power. as far as I understand you are looking for a delay before RDP_Autologin starts or another way to ensure that there is a working network connection before the start. First, the latest RDP_Autologin binary is at https://github.com/hjgode/rdp-auto-login/blob/master/rdp-auto-login/Windows%20Mobile%206%20Professional%20SDK%20(ARMV4I)/Debug/RDP_autoLogin.exe?raw=true. Possibly that fixes your issue with FitRemoteDesktop. About your complain about the device not going to sleep when RDM_KeepBusy is running, you are the first one that raise that. You should go with Raffaele’s solution. I do not have any code in RDM_KeepBusy that explicitely prevents a sleep. You may also play with the various ‘simulation’ settings in registry. Some devices will power off the network adapter when going to sleep. That will result in a disconnect after the device resumes (assuming that Remote Dektop Mobile will disconnect before the network adapter is connected again). Using a fixed delay before RDM_Autologin does start it’s work may or may not help with a missing network connection. But this will be a unreliable solution. Even adding code that does wait for a connection may not be the solution you like. What, if RDM has a disconnect? Then you are back at the main dialog without an autologin. Honeywell offers Intermec launcher that enables you to lock down the device and offers some starter icons. These can be configured to be available only if a network is detected. If you use that, the device will start into the Launcher and RDP_Autologin will then be available if a network is detected. What do you like? I can add easily some delay at the start of RDP_Autologin. BTW: the full source is available. You may code yourself or hire some to change the code to your like. I was able to find solution to delay autostart until after wifi connects. I also found a way to get around idle timeout without using mouse emulator. Do you have an RDP_autoLogin.exe that is similiar to version 4 or 5 so I can have all my settings, but doesn’t use RDM_KeepBusy? I delete “startOnExit”=”\Windows\rdp_keepbusy.exe” in Registry so I should be all set. When reboot Handheld everything is good. When log out of RDP session and hit Connect on RDP screen all good. But if log out of RDP session and close RDP screen this brings us to the Intermec Launcher screen. Here I hit RDP_autoLogin and it starts working but then gets stuck. And in the Menu.ini file for iLauncher we have it set to automatically launch applications. I also tried it without automatically launch applications in iLauncher but RDP_autoLogin.exe still gets stuck. This is a developer blog, I would gain a lot of money if I would sell binaries. If you have an issue, you can download the code and fix yourself. So, there is no issue with running rdp_autologin multiple times one after the other. What I call Version 6 or later worked! Can you tell me what Version you call this latest one and what date stamp I can refer to it? I am sorry, but I do not use or expose a version number, there are only the commits at gihub.com. Please alway use the latest one. I would like to use your program on windowsCE terminal. Trying to load the source code with VS2008, the opening attempt fails with an error saying the plateform used is not available on my VS2008! Do you think there is a way I can get access to your source code? Based on your source code, we attempted to build a WindowsCE autologin with RDP based on CETSC.EXE instead of the one used with Windows Mobile. We succeeded in building a new exe and we ware able to send login and password into the cetsc window using keybd_event which is a quite hard and non controlable method. for which we would need to find out the correct arg intended to WindowsCE and CETSC environnement. If you don’t mind, please send me a private message, so that we could find a way for us to build our exe and for you to find any kind of satisfaction you would consider. for Windows CE you normally need no separate autologin app, the ‘normal’ cetsc.exe supports using rdp files for autologin. But this depends on the Windows CE build of the OEM. A second option is to build your own cetsc, the source code is part of the free downloadable platform builder for your windows CE version. To find the right target ‘windows’ to use settext etc., you can use the scanTscWindow (see https://github.com/hjgode/rdp-auto-login/blob/master/rdp-auto-login/tscDialog.cpp). The dialog IDs etc are set in myDlgItems. 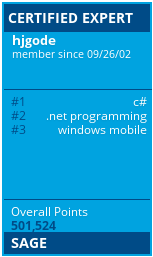 the VS2008 Code is written with a Windows Mobile 6 Pro SDK installed. These are coded into the project file. If you do not have the WM6pro SDK installed, the project will not load. you are right that we can pass a rdp file as arg to cetsc to load rdp configuration. Unfortunately, for some dark security reasons, Microsoft stopped supporting saving username and password in rdp files from Win CE 5.0! The username can be loaded from the registry but we found no way to load password! That’s why, the way you treated the issue with WM, is a solution for us, sure not very clean, but this works. Indeed, if we can build our own cetsc, then it’s much more better but we do n’t know at all where to download the downloadable plateform: The unit is a Symbol industrial terminal that the manufacturer compile WinCE with some built in drivers for screens, wifi… and i’m not sure we could rebuild the plateform. If you have any idea to suggest in how to build our own cetsc, let me know, please. Otherwise, I thank you again and we will continue to work based on your links to send credentials to cetsc window, as it seems to be a good option for us.